You can discover even more details about a track that’s playing than offered in Spotify Standard view, where just the artist and track are displayed. When viewing what’s playing, tap the I button on either iPhone or Android to bring up an information screen that features more details. You can also perform some common actions from this screen. Track information and playback on Android. Track information and playback on iPhone. Album Title: The album on which the track appears. Tap it to bring up a list of all tracks on that album. Artist: Tap the artist’s name to see a list of her albums. Add to Playlist: Tap Add to Playlist (there’s room to show only the Add To on the iPhone) to bring up a list of your playlists. 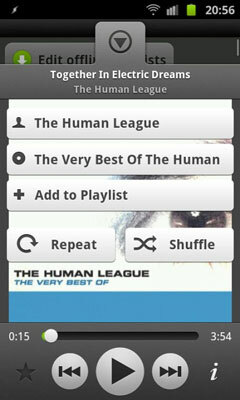 Scroll down the list, if necessary, and then tap a playlist to which you want to add the currently playing track. Star: Just like with the desktop app on your computer, you can star a favorite track by tapping the empty star, which fills it with a nice shiny gold one. Like playlists, this information gets updated centrally, so you can star a track for listening on your computer later. Shuffle: Tap this button to turn on Shuffle mode. Tap it again to turn it off. Repeat: To start playing the playlist of tracks again after it ends, tap this button. Like the Shuffle function, you tap it again to turn it off. Playback functions: Play or pause (stop) a track, go forward and back in your Play Queue, and jump to a certain part of the track by using the timeline slider. On iPhone, you can also tweak volume by using the slider. 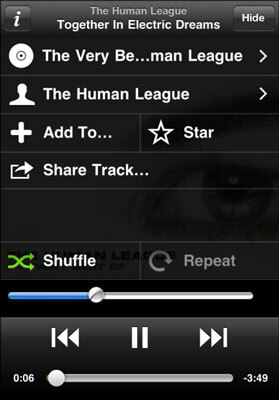 Share track: Share tracks with your friends by using your phone (see the following section for more on how to share).